Boy, is it close up at the top. But rather than keep switching the No. 1 horse every few weeks based on the latest big-race winner, I decided to stick with this guy for now, partly because of his potential to be any kind and his combination of tactical speed, acceleration, and stamina. Also, fast track or not, he did run by far the fastest 1 1/8 miles of the year and did it pretty much on his own. And he continues to work super. Showing once again how pushbutton he is and how you can turn him on and off, he went off very slow in his most recent work and then came home his second quarter in :23 2/5 before galloping out strongly, as he always does. Most people are saying what a wide-open Derby this is, but it is very possible it’s not as wide open as one might think. It could actually be about two or three classy, fast horses, in this case Always Dreaming, Irish War Cry, and Classic Empire, who have the ability to separate themselves from the others. 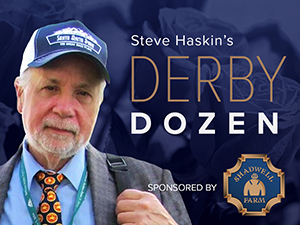 This has been the trend in recent years, and that could be due to the decrease in pure stamina and increase in lightly raced horses who simply are not prepared for such an arduous task, making the Derby more about superior talent and brilliance than anything else. We saw it in the Breeders’ Cup Juvenile last year. We also saw it in last year’s Derby when Nyquist and Gun Runner opened a 5-length advantage at the quarter pole. The year before, American Pharoah, Dortmund, and Firing Line opened up by 3 lengths at the quarter pole and 4 lengths at the eighth pole. In 2014, California Chrome opened a 5-length lead at the eighth pole. And in 2012, Bodemeister opened a 5-length lead at the three-sixteenths, with I’ll Have Another the only horse within striking distance. The exception was 2013 when it was sloppy and the pace was brutal, setting it up for the deep closers. So, if that trend continues, it’s easy to envision Always Dreaming, Irish War Cry and Classic Empire opening up on the field turning for home. The only question one might have with Always Dreaming is whether he will “bounce” off a huge 9-point jump on Thoro-Graph. But he does have a fairly strong 2-year-old figure to fall back on and five weeks between races. Motion will keep him at Fair Hill, where he has been thriving, and will work him the Saturday before the Derby, so he won’t be doing much serious training at Churchill Downs. It used to be that you wanted your horse to work over the Churchill track, but that hasn’t been the case in recent years. As mentioned with Always Dreaming, his main strengths are the weapons that have been used by recent Kentucky Derby winners, and we can certainly see him and Always Dreaming, and even Classic Empire, separating themselves from the others, especially considering the inconsistency of so many of this year’s 3-year-olds. He is the only 3-year-old with three triple-digit Brisnet speed figures, and in one of his other two races he earned a 99. The only blemish on his record of consistently fast races is his inexplicably dismal performance in the Fountain of Youth; a mystery that will remain unsolved and soon likely will become totally meaningless. With Classic Empire’s big comeback score in the Arkansas Derby, you probably will get slightly better odds on him and Always Dreaming at Churchill Downs. He does have pretty much the same running style as Always Dreaming, so it will be interesting to see how that plays out between John Velazquez and Rajiv Maragh. But the key is going to be how well he relaxes, which is something you don’t have to worry about with Always Dreaming. He has always been a bit precocious, and he must get through that early cavalry charge into the first turn without getting too keyed up. Once he gets through those early stages and settles, that’s when he becomes extremely dangerous. He turned in a sharp 5-furlong work in 1:00 3/5 by himself at his home base at Gulfstream Park West, coming home his last quarter in :24 1/5. It looks as if he came out of the Florida Derby in excellent shape, and we’ll see how he thrives in Kentucky and how he handles the track, He is scheduled to ship to Churchill Downs April 22. I still believe he is the most reliable of all the closers, who can make his move early or late, and has the pedigree to sustain it, regardless of how far they go. If there is one horse who can adjust and take dead aim on Always Dreaming, Irish War Cry, and Classic Empire it is this honest and consistent colt, who has shown what kind of devastating turn of foot he has on more than one occasion. Some seem to be down on him after the Florida Derby, feeling he is tailing off because he couldn’t threaten Always Dreaming, but the feeling here is that he ran as good as could be expected, especially considering he didn’t need to win, coming off a monster Thoro-Graph figure that was by far the fastest number run by a 3-year-old this year, and was at a huge disadvantage with absolutely no shot the way the track was playing and how the race set up. On top of that, he was beaten by an extremely talented colt with unlimited potential. Let’s see what he looks like from a physical standpoint as the Derby nears. If the pace is solid enough and he has a relatively trouble-free trip, I fully expect those blue silks to be flying down the stretch, possibly even before that. And he is one horse you can count on not getting tired late. It was great to see the champ return to his form of last year, and I’m sure most people will elevate him back to the No. 1 spot. I need a bit more time to digest everything before doing that. I’m still trying to decide whether he is going to move forward off his victory or regress, coming back in three weeks after a long, but eventful, layoff, having only one disappointing effort in 5 1/2 months prior to the Arkansas Derby and a 2 1/2-month layoff between his last two races. Can he come back in a relatively short period of time after a hard-fought race? And with the first five finishers within 2 1/4 lengths of each other, and two horses flying from the back of the pack and the speed hanging tough, do we really know the true quality of this field? Remember, he was all out to defeat Conquest Mo Money, who was crushed by Hence over his home track in the Sunland Derby. For Beyer pundits, his 94 speed figure is nothing to rave about, but at least it leaves him with room to improve rather than regress off a huge figure and he does have three very fast races on Thoro-Graph at 2. But most important, will Classic Empire maintain his good behavior, especially on Derby Day? These are all questions that one must ponder. There is a good chance he simply is the classiest horse in the Derby; certainly the most accomplished at 2 and 3, and won the Arkansas Derby purely on class. Coming off the layoff, that race might have just been the tip of the iceberg, and if it is and he should move forward off it, he’s going to be awfully tough on May 6. All the credit to Mark and Norm Casse for a tremendous training job and coming up with the brainstorm of getting this colt to Winding Oaks Farm for his final few works, where, as I mentioned before, he worked brilliantly and professionally and obviously was inspired by the ghosts of Dr. Fager and all the greats who were born, raised, and trained there when it was Tartan Farm. Hey, it makes a great story, and anything to romanticize the Derby. He bounced out of the Blue Grass in rousing fashion with another superb work, drilling a sharp half in :47 4/5, coming home his final eighth in :11 2/5 and going out an additional eighth past the wire in :12 1/5 and then galloping out 6 furlongs in 1:13 2/5. All the pieces seem to be coming back together. The more I watch the Blue Grass Stakes, the more I wish he would have had just a little more punch in the stretch, even with his bad trip. What was most amazing was that he, J Boys Echo, and Tapwrit, the three strongest closers, all were one-paced in the stretch and not making up an inch of ground. That could add up to a dislike for the surface on that day, if you’re looking for any excuse. I have found over the years that many horses who run super at Keeneland do not duplicate that form on the Churchill Downs surface and vice versa. I have seen many impressive Ashland winners do nothing in the Kentucky Oaks and have seen many horses who disappointed in the Ashland run huge in the Kentucky Oaks, the latest being last year when Cathryn Sophia finished a disappointing third in the Ashland at 1-2 with no excuse and then won the Kentucky Oaks by almost 3 lengths at a generous 9-2. There is a reason why the last Blue Grass winner to come back and capture the Kentucky Derby was Strike the Gold in 1991. So, while there appears to be mixed emotions regarding the merits of his Blue Grass performance, I am expecting a much improved effort at Churchill Downs, where he is undefeated in three starts, including two stakes victories. I also have faith in Ian Wilkes and the Carl Nafzger influence in getting a horse to peak on Derby Day. We saw Wilkes do the exact same thing with Fort Larned, who was a well-beaten third in the Jockey Club Gold Cup as the 5-2 favorite, and then came back to win the Breeders’ Cup Classic at 9-1. I would love to have him ranked higher, but the four above him are just too strong to lower. He went a little quicker than Sharp would have liked in his first work since the Louisiana Derby, drilling a half in a bullet :47 4/5 in company after an opening eighth in :11 3/5 and the 3 furlongs in :35 2/5. It was the fastest of 29 works at the distance. Actually, I always like to see a horse come back from a tough race with a sharp work, and Rosie Napravnik, who was aboard, was happy with the way he went. The Derby is still three weeks away and Sharp can always adjust by slowing him up a bit next time when he’s not as fresh. He still hasn’t decided whether his next work will be at Churchill Downs or the Trackside training center where he is stabled. You probably will wind up getting shorter odds on him than you’d want having Mike Smith aboard. But that also will move him up, as his style suits a sharp-thinking rider like Smith, who you know will have him positioned in the best spot possible. All the talk about his 91 Beyer figure in the Louisiana Derby could negate Smith and raise his odds and make him awfully enticing. We have no idea what he’s been beating at Fair Grounds, especially with the lightly raced maiden winner Patch shipping in and finishing second off two lifetime starts and Guest Suite not firing. But with this guy, it is all about gut feeling and the way he does it. If you look at his Brisnet figures, he and Always Dreaming have the fastest late pace figure (112), but Always Dreaming did it after a 54 middle pace figure, while he did it after an 80 middle pace figure. So based on that, gut feeling, the addition of Mike Smith, and his increasing Brisnet speed figures, I still feel he is a major threat. This surprise return to the Dozen, and this high up, is based on several factors. He had more trouble in the Blue Grass Stakes than I originally thought and he is the only horse to have earned triple-digit Brisnet middle and late closing figures (101 and 103, respectively) in the same race (in the Gotham), the fastest Brisnet speed figure this year (104 in the Gotham), and has the third fastest late closing figure (110 in the Withers). In the Blue Grass, he bobbled slightly coming out of the gate and was bumped from both sides, then had McCraken cut him off going into the first turn. When asked for his run nearing the half-mile pole, he was moving quickest of all when he ran smack into a traffic jam, was jostled around a bit between horses and had to throttle back just enough to lose his momentum and fall back to last. As for historical perspective, I can’t help but think of Thunder Gulch running an uninspiring fourth in the Blue Grass only to score a decisive victory in the Derby at 24-1. I can’t help but think of Bluegrass Cat finishing fourth in the Blue Grass, getting trounced by over 21 lengths, then rebounding to finish second to Barbaro in the Derby at 30-1. I can’t help but think of Sea Hero finishing fourth in the Blue Grass and then winning the Derby by 2 1/2 lengths at 12-1. I can’t help but think of Invisible Ink tiring to finishing fourth, beaten 8 1/2 lengths, in the Blue Grass, rallying from far back to finish second at 55-1 in the second fastest Derby of all time. And I can’t help but think of Closing Argument finishing third, beaten 9 lengths in the Blue Grass, just getting caught in the final strides in the Derby at 71-1, with the horse who won that Blue Grass by 6 lengths, Bandini, finishing 19th in the Derby. As you can see, every one of these horses mentioned who made a dramatic turnaround from the Blue Grass to the Derby all finished an uninspiring fourth at Keeneland, except Closing Argument, who finished third, a neck away from fourth. Sound familiar? For that reason, along with his excellent Brisnet speed figures and his trouble in the Blue Grass, I am putting him back in the Dozen as a forgotten longshot and potential overlay just like those mentioned above. He is one of the biggest enigmas in the race. Last week I listed all the Derby winners who were coming off the exact same effort in their final prep he turned in at Keeneland. And if I was more certain about his ability to stay the mile and a quarter, he would be way up near the top, but I honestly don’t now how far he wants to go, and that question mark still hangs over his head. He had every opportunity to get past Irap the length of the stretch, and even though he couldn’t, I don’t hold that against him, being it was only his second start and he did move way forward off the Fountain of Youth. Again, going by gut feeling, he gets major points for winning the historic Champagne and Hopeful Stakes the way he did. And he’s a big powerful colt with muscles on top of muscles who can fire at any point in the race, and I want to believe he is now ready to stretch out to 10 furlongs and turn in a peak effort. But I haven’t been able to fully convince myself, and there are others I know for sure who will get the distance. So still being indecisive, I’m going to keep him on the fringe for now and see how he trains at Churchill Downs. It looks like his bandwagon is filling up fast, and I can see him moving up the list as we get closer to the Derby. With Irap’s victory in the Blue Grass Stakes and Conquest Mo Money’s gutsy second in the Arkansas Derby, the Sunland Derby is looking better and better, and he totally dominated that race with a powerful 5-furlong sustained run, sweeping past horses on the far outside and getting floated wide by Conquest Mo Money turning for home. Not only did he crush his field by nearly 4 lengths in 1:48 flat, with another gap of 4 lengths back to the third horse, his 103 Brisnet speed figure is the fastest last-out number of any of the Derby horses. In addition, he is one of the early arrivals at Churchill Downs and is working brilliantly, breezing a half in :47 4/5 and then working 5 furlongs in 1:00 2/5 in company with Local Hero, coming home his final eighth in :11 4/5 and galloping out 6 furlongs in 1:13 2/5 and 7 panels in 1:27 in a terrific lung opener that should have him fit and tight for the Derby. This was the kind of work you wanted to see from a horse who is going to have 6 weeks between races. And as I have mentioned on numerous occasions, his remarkable maiden victory at Oaklawn was one of the great recoveries from near disaster you’ll ever see. I still don’t know how he managed to win that race. What happened to him in the Southwest Stakes is one of the many mysteries that likely will go unsolved, along with Irish War Cry’s debacle in the Fountain of Youth Stakes and Gormley’s uninspiring effort in the San Felipe Stakes. Now with Classic Empire, this no doubt is the year of the rebound performance. We’ll have to see if the colt will have a change of riders in the Derby, as Asmussen’s phone I’m sure has been ringing constantly. Shirreffs gave him a little 3-furlong blowout in :37 4/5 just to keep him on edge. It is extremely rare to have the top-ranked Santa Anita horse at No. 9 after all the success they have had in recent years, but with Mastery out of the picture, this is a confusing bunch, especially with the only success they have had shipping East has been with maidens. In his case, what was important was seeing him rate several lengths off the pace in the Santa Anita Derby and come on in the stretch to run down the speed. The race was extremely slow, time-wise and speed figure-wise, but he has already demonstrated his speed, getting a very fast Thoro-Graph figure in the Sham Stakes. He no doubt will be big odds at Churchill for a Santa Anita Derby winner, and you just have to decide whether to look at his race in a positive light or negative light. And if you consider his pattern of winning race, bad race, winning race, bad race you have to wonder if it’s time for a bad race or if he can finally put together back-to-back good races. In short, there is a lot to ponder with him, as there are all the Southern California-based horses. Having four lifetime starts and considering his style of running, he probably is better suited for the Preakness, but still has to be considered a legitimate contender for the Kentucky Derby based on his good second to Irish War Cry in the Wood Memorial coming off a two-month layoff. The question is, how much improvement does he have in him and how will he be able to negotiate a trip going a mile and a quarter with so little experience and facing several brilliant horses who have the same running style? He would also need to find a new rider, with John Velazquez riding Always Dreaming. And if Javier Castellano sticks with Gunnevera, Pletcher will have to look outside his two go-to riders. There is no doubt this colt has a great deal of talent and a bright future, which is why he is in the Top 12, and whether or not he would be better off waiting for the Preakness, it is tough for an owner to bypass the Derby. Pletcher is in the same position with Malagacy, who appears to have stamina issues, and Patch, with the latter having only three lifetime starts. So all we can do is wait for the dust to clear at the Pletcher barn and see how many he will put in the starting gate on May 6. If you watch the finish of Blue Grass Stakes carefully, you will see that Irap, despite being on his wrong lead the length of the stretch, actually is increasing his lead over Practical Joke as they’re approaching the wire. Was it a fluke or is Irap a much better horse than people think, and is just now putting it all together? I’ve been talking quite a lot about high altitude training, referring to the shocking Derby upsets by Mine That Bird and Canonero, both having trained in high altitude cities before coming to Louisville. And then you had Conquest Mo Money nearly pulling off the Arkansas Derby upset at 17-1 in a very game effort after training all winter at Sunland Park, with an altitude of 3,800 feet. Well, it is interesting to note that Irap did run twice at Sunland Park this year before winning the Blue Grass Stakes. Granted, 3,800 feet is not like training in the Andes, but even if it helps a little when coming back down to sea level it could make a difference. Whether it would continue to help four weeks later is another matter, but it is still a point of interest, especially if we have no idea how good this horse is right now and no idea if he can duplicate that effort at Churchill Downs. He is a son of Tiznow and apparently has his sire’s tenacity and toughness, and the Tiznows keep getting better, so we really don’t know for sure what to expect from him. I dropped MALAGACY, even though he ran a terrific race from the 12 post and battled through quick early fractions, just giving way in the final 70 yards. Although it was a courageous effort, I just don’t think, with four lifetime starts, two of them sprints, and Pletcher once saying he’s likely a one-turn horse, that he’s quite ready to go a mile and a quarter. He could, however, be a live Preakness horse with the extra two weeks. I also dropped ROYAL MO, who was a late addition last week with the last-minute defection of One Liner, because he sits at No. 24 right now on the points leaderboard. With late closers LOOKIN AT LEE and SONNETEER, who were both flying late in the Arkansas Derby, leapfrogging him and no doubt headed to Churchill Downs, he would need THUNDER SNOW and Malagacy to drop out just to get to the No. 21 spot, and then would need another defection. Lookin At Lee in particular ran a big race to finish third, having to meander through the field in the stretch looking for openings, his rally falling 1 1/2 lengths short. He actually cut his margin of defeat against Classic Empire in half from the Breeders’ Futurity and chopped 10 1/2 lengths off his margin of defeat to the champ in the Breeders’ Cup Juvenile, so there is hope for him if he can make the cut. Sonneteer closed strongly on the far outside to finish a half-length behind Lookin At Lee, proving his second-place finish in the Rebel Stakes was no fluke. You can make a case for either one these two to be in the Top 12, but it’s difficult putting one on and not the other, even though Lookin At Lee is a lot more accomplished. But these both are one-dimensional late closers who come from the back of the pack and will be totally dependent on a very fast pace in the Derby. As of this writing, a decision whether to put up the $200,000 supplementary fee for CONQUEST MO MONEY, a gutsy second, beaten a half-length, in the Arkansas Derby will be made sometime later today (Tuesday). As I’ve been saying, I find it uncanny how these horses racing and training at high altitudes have come down to sea level and run their tails off. Even horses who just raced there recently like Firing Line and Irap (who raced their twice) have run big races in their next start – Firing Line a close second to American Pharoah in the Kentucky Derby and Irap in the Blue Grass Stakes. It is also interesting to note that Mine That Bird finished second in the Borderland Derby and fifth in the Sunland Derby before upsetting the Kentucky Derby, while Irap finished second in the Borderland Derby (Now the Mine That Bird Derby) and fourth in the Sunland Derby before upsetting the Blue Grass Stakes. The Louisiana Derby, which many feel was a weak field, received a boost Saturday when sixth-place finisher SENIOR INVESTMENT just got up to win the Lexington Stakes at 11-1. NO DOZING finally woke up after getting away from Tampa Bay Downs, finishing third, beaten a head and a neck, in the Lexington. One horse no one is talking about or taking very seriously is the Spiral Stakes winner FAST AND ACCURATE, who is riding a three-race winning streak since being given Lasix. But they have all been on synthetic or grass and he did break his maiden for a $30,000 claiming tag and was not nominated to the Triple Crown. But he has been training brilliantly on the dirt at Churchill Downs’ Trackside training center, turning in a pair sharp works, his latest a 5-furlong drill in :59 3/5, coming home his final eighth in :12 flat after a pair of :11 4/5 eighths. He then galloped out the 6 furlongs in 1:13 4/5. When asked about STATE OF HONOR’S tendency to throw his head up early in the race, regardless of whether he’s wearing blinkers or not, assistant trainer Norm Casse said he believes he got angry in the Florida Derby when Three Rules came over into him. Casse said they probably will work him alone leading up to the Derby. Even with this bad habit, the son of To Honor and Serve has racked up four second-place finishes and one third-place finish in stakes since breaking his maiden last year at Woodbine. Like he did in the Florida Derby, once he settles in stride, he hangs in tough, and it’s obvious there is no quit in this horse. He tuned up at Churchill Downs with an easy half-mile breeze in :49 4/5. Santa Anita Derby runner-up BATTLE OF MIDWAY turned in a solid half-mile work in :48 2/5 at Santa Anita. Louisiana Derby runner-up PATCH, breezed a half in :49 2/5 at Palm Beach Downs. I don’t know if people realize just how good this one-eyed colt is, but he has to have a world of ability to do what he did in the Louisiana Derby off only two lifetime starts. But is it asking too much to throw him into the Kentucky Derby stampede with only three starts? If you want to know where MASTER PLAN, a fast-closing third in the UAE Derby, is these days, he breezed a half in :51 2/5 at the WinStar Farm training center. Will he try to make it back-to-back Belmont Stakes victories for co-owner WinStar Farm? As the field finally begins to firm up and we have a pretty good idea who the 20 starters will be, with a few exceptions, it is interesting to note that there appears to be as many as eight horses who want to be on or near the lead – Always Dreaming, Irish War Cry, Battalion Runner, Irap, State of Honor, Royal Mo, possibly Battle of Midway, and Conquest Mo Money if they decide to put up the money. If you’re looking for an interesting four-horse exotics box, how about the four horses who ran inexplicably terrible races with no noticeable excuses this year and bounced back to win their next start – Irish War Cry, Classic Empire, Hence, and Gormley. Even Royal Mo came back off a dismal performance and ran a huge race in the Santa Anita Derby. No reason for mentioning a potential wager this early, just a way of pointing out the weird trend this year of horses rebounding big-time off dreadful races.